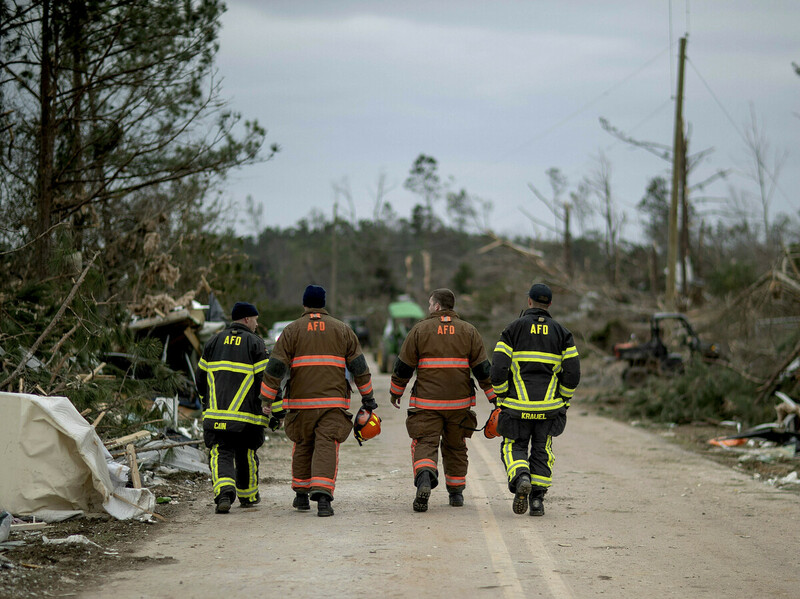 After Alabama Tornado, Search For Missing Continues And Recovery Begins The death toll from the storm stands at 23, with victims ranging in age from 6 to 93. One family, connected by marriage and living in two homes along the same road, lost seven members. First responders walk through a neighborhood heavily damaged by a tornado the day before in Beauregard, Ala., on Monday. The death toll from the storm stands at 23, with victims ranging in age from 6 to 93. In Lee County, Ala., teams are searching for seven or eight people still missing in the wake of an extremely powerful tornado that swept through the area on Sunday afternoon. The death toll from the storm stands at 23, with victims ranging in age from 6 to 93. They have all been identified and their families informed, according to the coroner. One family, connected by marriage and living in two homes along the same road, lost seven members. "Just keep those families in your prayers," said Lee County Coroner Bill Harris. "It's a tragic situation." Opelika, Ala., Fire Chief Byron Prather said teams will continue to search as long as necessary to make sure they haven't missed anyone. "We are still conducting some searches in the area, searching through piles of debris where there may be people or animals ... So we haven't given up hope. We're still searching." Officials say they hope to be able to shift from search and rescue to recovery status on Tuesday. Lee County Sheriff Jay Jones said they had narrowed down the search areas, and the number of missing people had decreased significantly. Heavy equipment is being used to lift large pieces of debris, he said, and certain areas continue to be restricted to only first responders and search teams. President Trump said he pledged his "unwavering support" to the residents of Lee County. He will visit affected areas in Alabama on Friday and meet with Gov. Kay Ivey. John De Block, a meteorologist with the National Weather Service in Birmingham, described the tornado's nearly mile-wide path to NPR member station WBHM: "The tornado struck shortly after 2 o'clock in the Macon County/Lee County line. ... From there it went into the Beauregard community area, progressed across southern portions of Lee County just north of Smiths Station," before crossing into Georgia. Wind speeds were up to 165 miles per hour, he said. When the tornado touched down, Lee County resident Johnny Washington was asleep, he told WBHM. He sought refuge under his bed. "After what I woke up and seen this morning, I'm in shock I'm still here," he said. Chris Darden is a meteorologist at the National Weather Service in Birmingham. Surveying the damage on Monday, he said any loss of life is regrettable — but with a tornado this powerful, it was almost inevitable. "You know 170 mile an hour centrifuge throwing bricks debris 2 by 8s," he told NPR's Russell Lewis. "They're all spears. ... They're all killing machines." But for the survivors, the effort starts now to pick up the pieces. Residents have been told they can start pushing debris on their properties out to the edge of roadways for eventual pickup. Patricia Moore lives in Beauregard, just south of Opelika. "I don't know I just think God is really trying to get people together, and seeing that that's what's going on now just looking around at everybody helping each other," she told WBHM. "It's amazing." Sheriff Jones was optimistic about the future, too. "This is a very tight-knit community," he told reporters. "These people are tough, they're resilient people. And it's knocked them down, but they'll be back."